Bavarian automaker has announced to invest $1 billion (nearly 5,987 crore INR) at it Spartanburg plant, South Carolina, USA. It will be the fifth expansion of the Spartanburg plant in its 20 years of existence. By the next two years, BMW will be able to churn out 4,50,000 cars annually which is nearly an up of 1,50,000 units. This venture will provide 800 new jobs at the plant, adding to the total workforce of 8,800 employees. The German giant also mentioned that their new SUV-Crossover, BMW X7 is coming to rival against the Audi's flagship Q7 and the Mercedes Benz's GL Class. The new three-row-seating vehicle will be made exclusively in this plant and the vehicle will be sold worldwide (as of now this vehicle will be exported from this plant only). A little what we know so far about this new entrant in the X-range is that it will share the under-pinnings with the next generation of 5 and 7-Series. Don't expect the vehicle to hit the market before 2017. 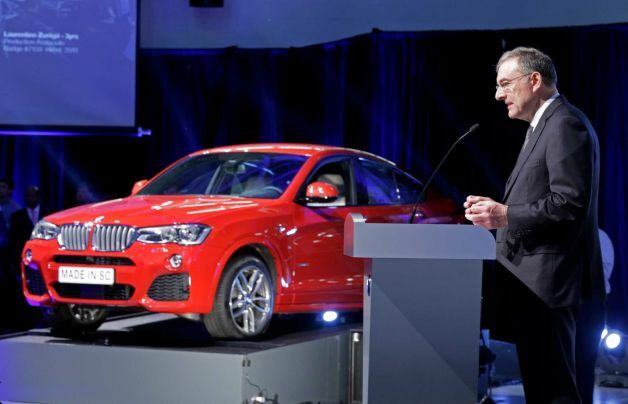 The focal point of the event was the BMW X4 - Crossover rolling down the production line at this plant (India bound! ), the new crossover will fill the gap between the X3 and the X5 SUVs. The X4 will hit the Indian market by next year. The crossover, when enters India will share its powertrains with the X3 SUV. BMW also announced that the 'Hybridized' X5 plug-in will also make its way into this plant in sometime soon. The Hybrid SUV was showcased at the Frankfurt Motor Show 2013 as 'BMW X5 edrive concept'. It looks like the sales of the German automaker has increased in the States plus the expansion of the plant is also export centric, seems like US has become competitive export site. The X4 and X7 both are bound to enter the country. Cheers! !